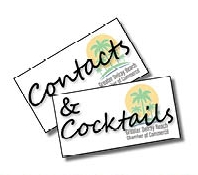 Join us for our monthly Contacts & Cocktails at Tin Roof Delray Beach! Contacts & Cocktails is one of the best way to gain a broader awareness for your business and build relationships within the community. For just $15 in advance, and $20 at the door, you'll enjoy cocktails (well drinks, beer, and wine) and culinary delights (i.e., a guacamole bar and dessert bar). Non-members are invited to join in as well at $30 per person. We will be on the outdoor patio. The Luvu Band will play on the outdoor stage from 6-10 PM. Park in the Old School Square parking garage; there is a flat fee of $5 after 4 PM Monday through Saturday. Pay via the Parkmobile App or at the meters near the elevators. Walk across Old School Square to Atlantic Avenue. Tin Roof is on the south side of Atlantic Avenue in between Honey and Bull Bar.